Waller Creek — the corridor that enlivens UT Austin just east of the original Forty Acres — is gaining center stage. Waller Creek — the corridor that enlivens The University of Texas at Austin just east of the original Forty Acres — is gaining center stage. Until recently, the creek had been simultaneously central to campus and nearly invisible, as noted in the proposed Waller Creek Framework Plan due to be finalized this fall. Part of the lack of focus on Waller Creek is rooted in history. Many say that the university turned its back on the creek almost 50 years ago after students protested the removal of trees to reroute San Jacinto Boulevard. Another part of this legacy is constructed, like the collection of buildings that make up the Cockrell School of Engineering. Waller Creek draws from a narrow but completely urban watershed of 3,662 acres. The stream flows through Austin, starting near the intersection of Lamar and Airport boulevards. It flows through and under neighborhoods and past the Intramural Fields. It bisects campus, goes through downtown and empties into Lady Bird Lake. The city and university are looking into ways to integrate Waller Creek back into community life. Currently, the creek is undergoing a renaissance of sorts. Although it has always been used by faculty members for hands-on learning and experience, interest in the creek as an outdoor classroom and living laboratory is becoming more formalized. “As Texas cities grow, natural watersheds will become urbanized,” said Jay Banner, a professor in the Jackson School of Geosciences and leader of the new urban watershed project. 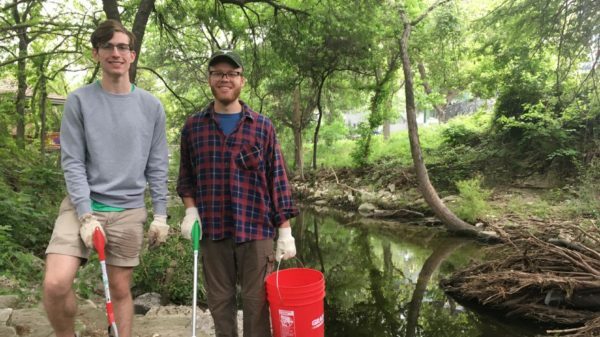 “We can learn lessons from Waller Creek and improve our understanding of the complex interactions between hydrologic systems, ecosystems and human infrastructure systems.” Banner plans to conduct research in the creek as part of the university’s Bridging Barriers initiative on Planet Texas 2050. On the UT campus, with safety paramount, dense brush and invasive species have been removed to increase visibility and sight lines, and Landscape Services is planting native plants along the creek’s path. The newest reinvention of the creek’s path through the city is the award-winning landscape design along several blocks of the Dell Medical School.